These crochet shorts are tons of fun!!! Great for running, walking, dancing, or just wearing every day. These one-of-a-kind shorts can easily be worn by a man or a woman, great for festivals, after the slopes, or for morning yoga in the winter. 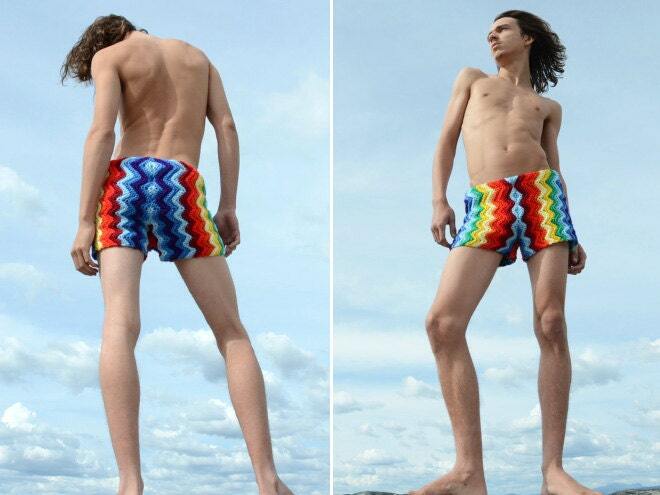 These shorts are made from recycled vintage afghans blankets. Please understand we make these out of recycled materials and not all color schemes are available at all times. Each is a unique, inspired creation. Please include waist size, inseam, and any ideas you have about color or pattern--we will do our best to match up what you are looking for with what we have in stock. You are also welcome to send us a crochet from your collection and we will upcycle it into shorts!! If we don't receive any other instructions with your order we will send a general medium size shorts in whatever color/pattern we have available. We are no longer working in "granny squares" for shorts due to logistical and quality concerns. One of a kind, handcrafted, recycled item produced 100% in the USA.